Every minute counts when lives are on the line, which is precisely why emergency services the world over depend on Argo XTVs. Their unparalleled ability to travel over land and water while carrying medical supplies and personnel makes these XTVs the ideal tool for search and rescue operations in both remote areas and places struck by natural disasters. No matter where you need to go, an XTV can take you there. The cab is built inside a leak-proof hull and the tires act like paddles in the water, letting the vehicle traverse lakes, rivers, and streams just as easily as it covers dry ground. Its unique design also gives it a low center of gravity, letting it climb steep grades while being far less likely to flip than comparable ATVs and UTVs. Need to cross frozen bodies of water? If the ice cracks, the XTV floats safely on the water. What about sand and mud? The giant tires spread the load, letting the vehicle float over soft surfaces instead of sinking into them. Argo knows their vehicles are popular with emergency services, and it’s easy to see why. They worked with Ferno to integrate life-saving equipment into their designs, adding mounts for a standard stretcher or a basket for helicopter evacuation. Both carriers can be used with an immobilizer to prevent spine injuries. A mount can also be added to carry an oxygen tank, and every Responder has a built-in first aid cabinet. You can also add a winch to pull out stuck vehicles and move logs and other obstacles. Do you need to work in large, remote areas? Add a D-ring kit, and your Argo can be carried by helicopter to the rescue site, letting you drive in the rest of the way. Of course, you don’t need to be in the wilderness to find an Argo useful. When disaster strikes, these vehicles can maneuver across waterways when bridges are damaged and over rubble from destroyed pavement and buildings. In floods and blizzards, the vehicle can simply ride over water and snow to reach areas that are inaccessible to most emergency vehicles. How well do these vehicles work in the real world? Odyssey Medical is Canada’s premier supplier of event medical support, working at mud runs, endurance races, and a variety of festivals. Their Frontier 8×8 Responder S is a key part of their services, having been used to transport over 1,000 patients. At one race event, heavy rains created mud that rescue UTVs were getting stuck in, but their Argo handled the conditions without a hitch, letting them continue bringing patients in for treatment. When Japan’s Hiroshima prefecture was struck by landslides after torrential rain, the fire departments of Okayama City and Kotsu sent their Argo to the area. Over the next two weeks, the vehicle was in constant use, helping rescue victims of the landslide, bringing emergency workers into areas where the greatest damage occurred, and keeping those workers supplied. 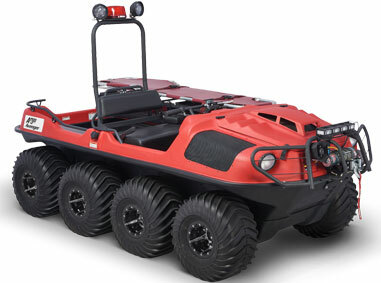 When an emergency occurs and response time is critical, you can depend on an ARGO 6×6 or 8×8 amphibious search rescue vehicle to meet your needs. In hurricane weather with devastating flooding, winter blizzards, remote region rescue or any other emergency in hostile environments, the ARGO will get you in and back out safely.